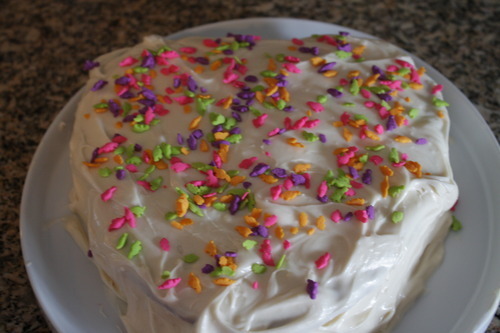 i adapted this adorable, heart-shaped little cake from Sprinkle Bakes for our valentine’s dessert: http://www.sprinklebakes.com/2011/02/heritage-red-velvet-cake.html. if you all don’t know about Heather at Sprinkle Bakes, you are missing out. big time. her food is beautiful, cheery, and so cute. back to the cake. i hadn’t made red velvet before, so it was interesting. i managed, of course, to get red food dye all over the place. 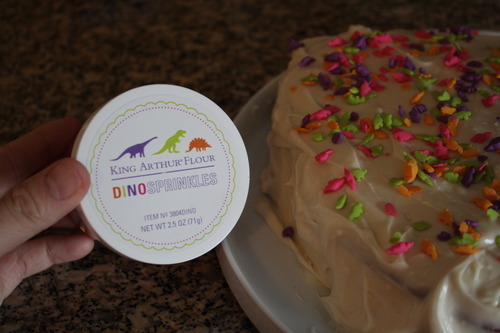 also want to share the dino-shaped sprinkles i got from King Arthur last summer when my car broke down…for the first time…and the fam spent the afternoon wandering the store while we waited for updates. at least something good came out of it! if you haven’t made red velvet before, make sure you are prepared for red dye splatter. even one sputter goes a loooong way.